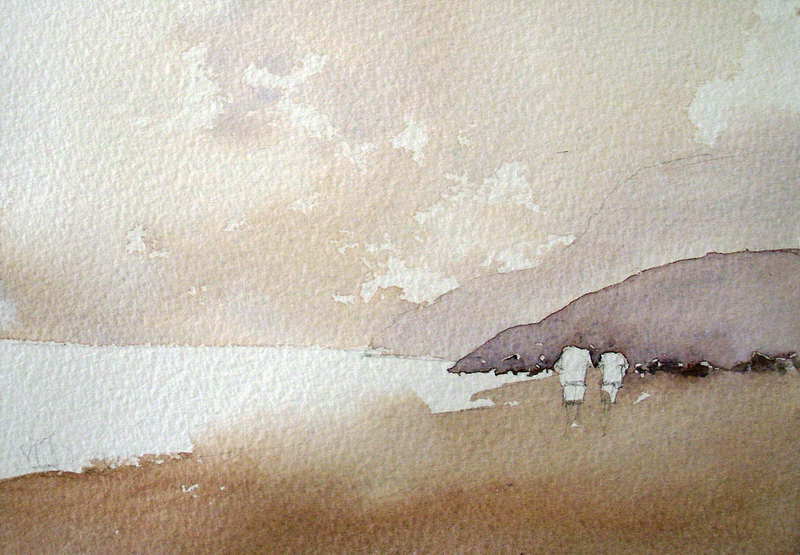 In this step, figure 5, paint the distant hills, leaving a few untouched areas at the bottom of the closest hill were rocks will be place in the next step. Paint one wash over both hills and let it dry thoroughly. Now paint the foreground hill with a similar strength mixture as was used for the distant hill. 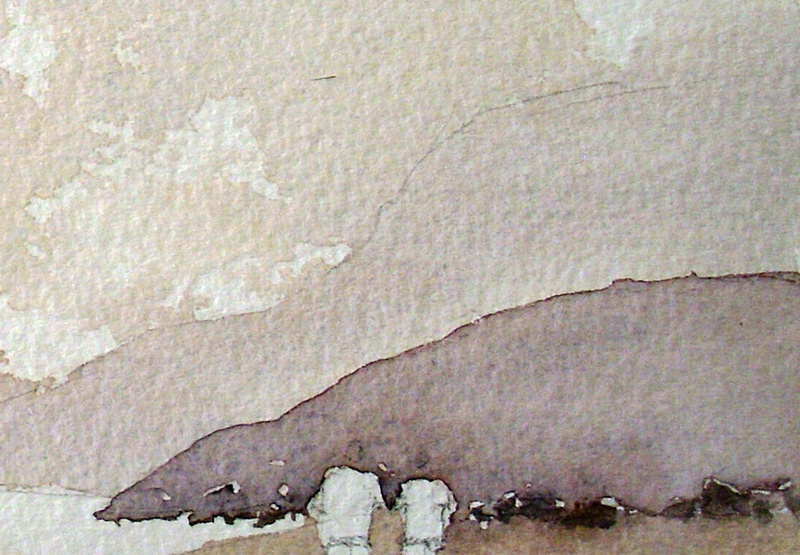 As watercolor tones are additive it will make the closest hill look darker and hence closer to the viewer. Remember to paint around the figures and the rock shapes at the bottom of the hill. Then with a creamy mix of French Ultramarine and Burnt Sienna, paint in the rocks, taking care to leave the odd highlight unpainted. Let us now look at how to paint sand with watercolor. After using the same two colors to mix a dull brown to the consistency of creamy milk, take a brush with clean water and wet a section of the painting where some of the sea will merge with the sand. Then while this area is still quite wet paint the sand. Remember to paint around the figures clothing. When using watercolor paint to paint the sand I pick up some of my pre mixed paint, drag the tip of the brush across the lip of my palette to take out some of the paint mix, and then I dip the tip of the brush in clean water. I do this to dilute the mixture a little before starting to paint the distant section of sand. This makes it lighter in tone and helps to create the feeling of space in my painting. 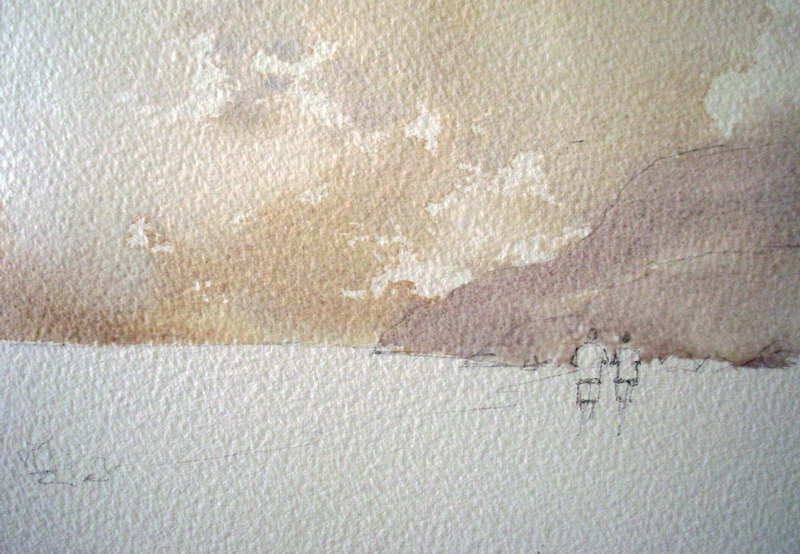 After this start to painting the sand I then just use the mixture in my palette, which is stronger and will make the foreground sand look closer to the viewer. You can also see, figure 7, that where the sand mixture hits the pre-wet area to the left of the figures, that a soft and lighter patch is created. Hopefully this will make that area read like wet sand later in the process of painting this watercolor.